Description: Pasadena's biggest and scariest haunt opens its catacombs for another October season. 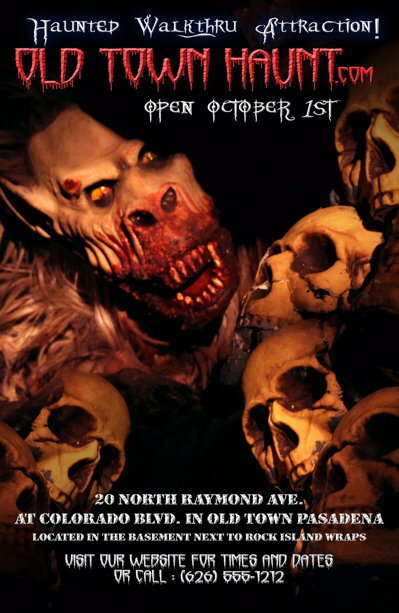 Although only a single-maze, it is one of the best Halloween attractions in Los Angeles - a definite must-see. Dates are October 1-3, 8-10, 15-17, 21-24, 27-31. Hours are 7-10pm weeknights & Sundays, 7-11pm on Fridays & Saturdays, with longer hours later in the month. There are also children's matinees (recommended for ages 7-12) on October 30 & 31 from noon to 4:00pm. Tickets are $14 general admission, $21 for VIP fast pass, and $8 for the children's matinees.